Animation of 'Oumuamua (dot, circled) moving against background stars, made from frames obtained by the Liverpool Telescope on 26 October 2017. The interstellar object currently exiting the Solar System has finally been named as ‘Oumuamua, Hawaiian for "reach out for" (‘Ou) and "very first/in advance of" (mua mua). Thus the name "reflects the way this object is like a scout or messenger sent from the distant past". ‘Oumuamua was first detected on 19th October by Robert Weryk at the Institute for Astronomy at the University of Hawaii using data from the Pan-STARRS telescope on Mauna Kea in Hawaii. After a few nights of routine observation, preliminary calculations showed it to be on an open-ended hyperbolic orbit, i.e. to have entered the Solar System from interstellar space. Moreover, it had already made its closest approach to the Sun some weeks earlier and was now receding rapidly from the inner solar system. Previously, the only other interstellar emissaries known to exist were a handful of microscopic dust particles discovered in 2014 in an aerogel dust collector brought back to Earth by the comet sample return mission Stardust. ‘Oumuamua on the other hand is estimated to be approximately 160 metres in diameter. 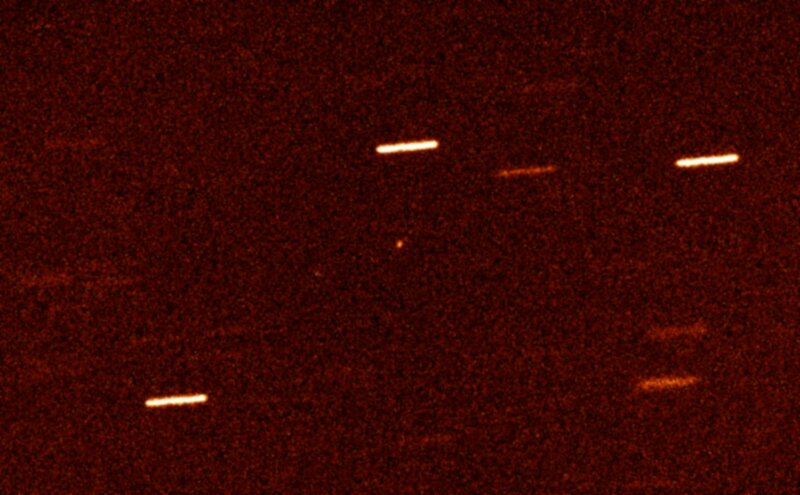 As this object is the first interstellar visitor observed, and was also rapidly becoming fainter as days passed, it become a race against time to observe ‘Oumuamua as much as possible before it passed out of detection range forever. Alerts were circulated around the global astronomical community in the early hours of 25th October. Later that day veteran LT user Alan Fitzsimmons of Queens University Belfast requested a priority observation via the LT's database, and that night the LT began observing ‘Oumuamua. The animated gif of Fitzsimmons' 26th October observations is at the top of this page. Below is imagery from the William Herschel Telescope taken by Fitzsimmons on 28th Oct.
‘Oumuamua (dot, centre) tracked against background stars by the William Herschel Telescope on 28th October. As a result of the efforts of astronomers around the world, not only has the orbit been definitively pinned down, but also aspects of its physical nature have been revealed. It's approximately 160 metres in diameter (assuming it reflects 10% of the sunlight falling on it), has a spin rate of possibly 6 hours, and has no cometary activity, despite getting as close as 0.25 AU from the Sun. Spectra are featureless and show its colour is red like a Kuiper Belt Object. That plus the lack of comet activity imply ‘Oumuamua must have spent so much time in the inner warmer reaches of its home star system that all volatiles had already disappeared by the time it left for interstellar space. ‘Oumuamua is now leaving the Solar System in the direction of the constellation Pegasus. By the time it leaves the Sun's influence, it will still be moving at over 26 kilometres per second, faster than any human-built spacecraft currently exiting our solar system. Efforts to trace its original stellar system, and where it might be headed in aeons to come, have so far been unsuccessful (the tiny errors in trajectory remaining after such a short arc of observations build up dramatically over millions of years). Given how relatively uncrowded stars are this far from galactic centre, ours might be the first Solar System ‘Oumuamua has encountered since it left home, possibly billions of years ago. Left: Blue crosshair denotes ‘Oumuamua's position in the sky as it entered the Solar system centuries ago. Centre: Trajectory of ‘Oumuamua through the inner Solar system. Right: Position of ‘Oumuamua in the sky when it leaves the Solar system centuries hence. Credits: Left and right: Sky Safari 5 Pro & J. Marchant, Centre: JPL/NASA.